September 30th is National Women’s Health and Fitness Day. For many women our health is secondary to the kids, our partner, the job, even what’s happening on Scandal before we dedicate the time to our health and fitness routine and that can lead to detrimental issues. Today Wednesday September 30th, organizations all across the country will host events to empower women to take care of themselves. 1) Be a Poser: Yoga is a great way to reboot, refresh and revive yourself today. Find a class that you can take on your lunch break or simply commit to 20 minute on youtube. 2) Start Walking: The weather in NY is still bearable so when I can’t get to the gym I make it a point to walk to as many locations as I possible can. The goal? 10, 000 steps. 10K steps a day is approximately 5 miles and a start to getting your body back on the fitness track! 3) Eat: Food is Fuel, and if you’re putting bad things in your body you just won’t be able to maintain the life you want. Try a new Paleo recipe , make a big salad for lunch and drink LOTS of water. 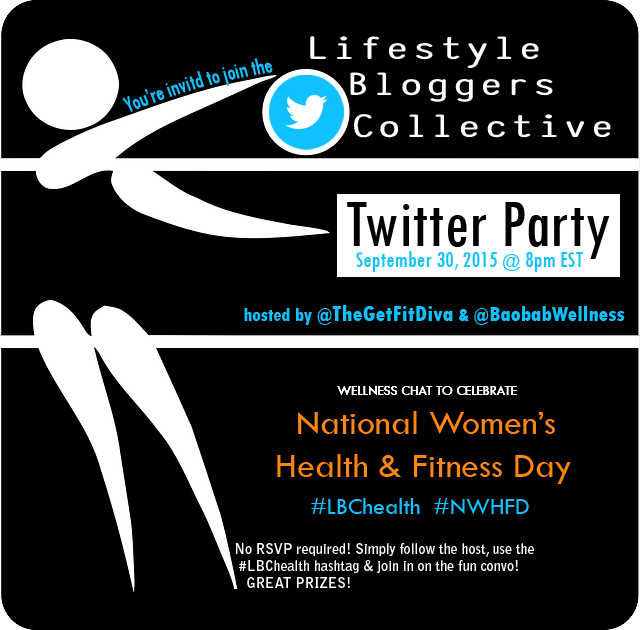 5) Join the Twitter party hosted by Aliah of Get Fit Diva, and I tonight at 8pm! Follow the host and the hashtag #LBChealth to join the conversation and the chance to win great prizes!